By ‘chain’ we mean the entire set of steps that a product goes through, from production to distribution, and to consumption. For six generations the Delsante family has been paying careful attention to all the stages of this process, complying with the strict rules that guarantee Parmigiano Reggiano its profile of excellence, quality and safety. 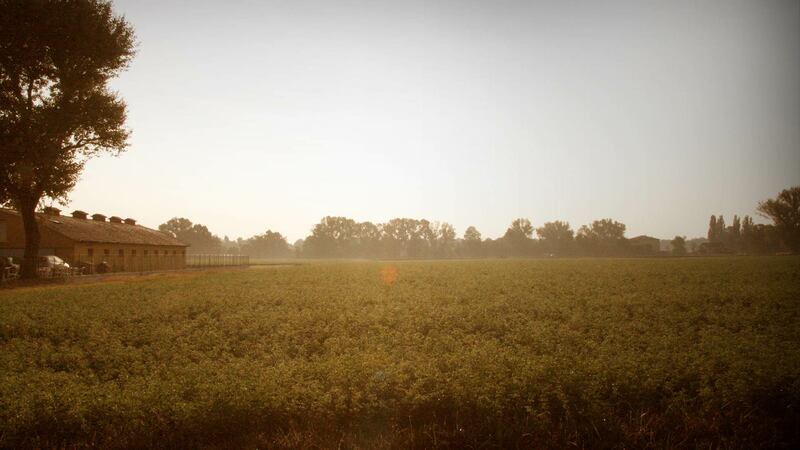 118 hectares of land are devoted to the cultivation of herbaceous plants for feeding the animals. 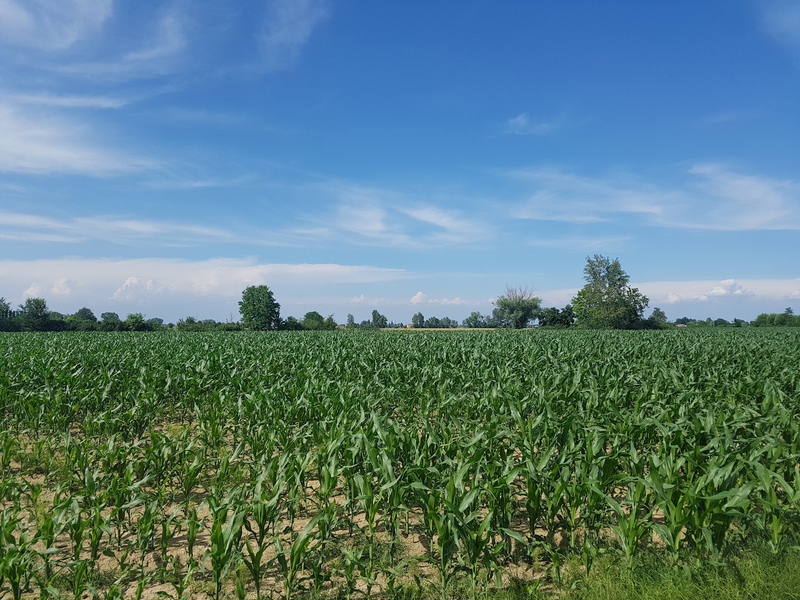 The crops chosen are the ones typical of the area and are provided by the Parma Agricultural Consortium and the Agrifutura group, which offers seeds using cutting edge techniques and with a low environmental impact. Most of the surface area is given over to alfalfa and rye grass used as fodder for the animals together with the crops from the permanent meadowland, made up largely of mixed grasses and millet. The fodder is harvested green or is turned into hay later by natural drying out in the fields. Common wheat and barley are added on rotation; these are sold or inserted into the feed for the milking cows and the heifers. The commercial fodders are analysed monthly by the contracted feed company (Carra) through the NIR technique (which is more modern and cutting edge) to obtain balanced, high-quality rations. The feed is supplied exclusively by Carra Mangimi SpA, a firm that thanks to its quality assured system guarantees our animals complete products rigorously inspected using official, cutting edge methods. We have studied various formulations on the farm to adapt the diet the best way possible to the animal’s productive and physiological needs. 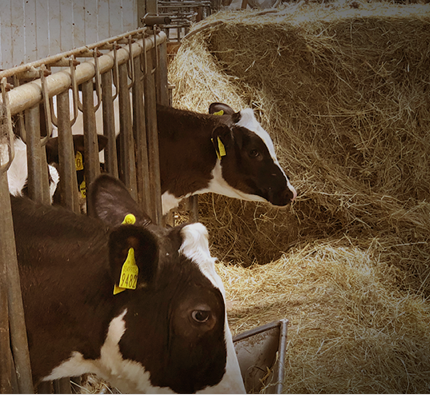 We have created personalised formulas for milking cows, growing heifers, cows and heifers that are pre and post-birth, dry, weaning calves, even according to the products’ seasonal availability. The path of the feed is outlined by filling out the feed register in which there are records of the delivery date, transport document number, product type and quantity, supplier, lot, silo number, destination and use. All of this is to guarantee the product’s traceability. Together with the register the paperwork for every type of feed is issued and preserved with the composition and analytical values of the nutritional parameters. 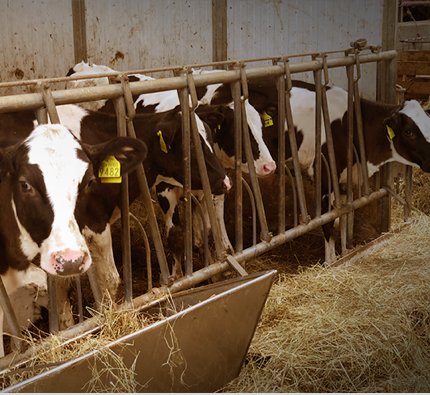 The water used on the farm and in the dairy come from the company well and are analysed every year by the contracted laboratory Eurofins Pivetti of Reggio Emilia (which in its turn has the “Accredia” accreditation) to check its suitability for use in chemical and microbiological terms. The fertilisation of the crops takes place through spreading natural, organic fertilisers, in other words ripe slurry and manure. Every time it is done it is recorded in a specific register where there is a description distribution methods, quantities distributed, crop involved and size of plot, date and title of nitrogen. These records are fundamental for checking conformity with the Nitrates Directive 91/676/EEC and the subsequent application of the regional application programmes on the subject of the agronomic use of farm effluents. The inspections are carried out by the provincial authority, which delegates them to the Local Health Authority (“ASL”). We have around 150 cattle of the black and white Italian Friesian breed. Every animal is registered on the Italian Cattle Register (“Anagrafe Nazionale Bovina”) and gets an individual code. The codes, gathered in a national database, enable the path followed by an animal during its life to be followed and reconstructed. Being put on the register ensures the tracking and traceability of the animals and the products obtained from them. The code or serial number is the number stamped on the ear tags attached to the animals and is made up of: -state code (IT); -Statistics Agency’s code for the province; -identifying code of the head of cattle. On the farm there is the Barn Register, a document that contains all the heads of cattle entering and leaving the estate, the reasons that determined their entry or sale, the date of birth and where applicable death. The cattle are inseminated both naturally by commercial bulls and artificially by veterinary experts with sperm selected by applying the most suitable improvement criteria for our production, or rather fat, casein”K BB” and calving ease. For the first days we feed the calves with the mother’s colostrum, then passing gradually to reconstituted milk formulated and supplied by the “Serval”, a French company very aware of the animals’ needs and food safety. The calves always have fresh, clean water available as well as feed rich in fibre and protein and a bit of hay to stimulate the growth of the ruminant system. Every movement of the milk from the barn to the dairy is recorded in the “Milk Delivery Register” where there are records of: collection time; registration number of vehicle; signature of producer or his proxy; signature of the driver. In addition the barn-dairy journey is just 2 km so the heat stress on the milk is close to zero. The milk is compulsorily analysed twice a month by the dairy, which then provides the barn with the analyses. The dairy delivers the milk to Eurofins, the world-leading bio-analysis group, which carries out analyses relating to: acidity; somatic cells; California mastitis test; presence of butterfats; research into inhibitors, fat, casein, protein, urea, lactose, freezing point, CMT geometric average, milk tanker T display, etc. As well as this, once a week the milk is analysed to check for the presence of aflatoxins (because of Regional rules). In the barn - apart from the analyses on the milk carried out in the dairy - once a month as a self-inspection the somatic cell count is carried out cow by cow. Once a week there are check-ups on cells, urea, fat, casein (as “tollbooth” parameters). The animals that have to be moved are accompanied by the documentation set out in Legislative Decree number 151/2007. In the documents there are reports of all the information relating to the transport, to the animal’s destination and to the animal itself, especially if it has undergone pharmacological treatment or if it has contracted illnesses. The transport is carried out by specialist, registered firms with trained staff and certified vehicles. The company has a team of commercial vets available who are divided up by area of expertise: gynaecology; mammal health; feeding; podiatry. They make weekly visits to the farm. Each animal has regular bacteriological analyses carried out with antibiogram to prevent resistance to antibiotics, while every possible pharmacological treatment is recorded in the related “Register of Treatments” to ensure compliance with the corresponding withdrawal times. The inspection work of the Local Health Authority checks on the real compliance of the farm to the mandatory regulations. It therefore checks up on the correct practices of veterinary hygiene, assesses the structures and the level of the animals’ well-being, examines the company records concerning the animals, medicines, feed and milk that are set out in the context of food safety legislation. The results of their inspections are then sent to the EU to check the maintenance of the standards required by the legislation in force. In the current social and market context the consumer is paying increasing attention to the topics of environmental sustainability, respect for labour and for the local area, to the seriousness and reputation of the company and the traceability of the production process. That’s why, since 2016, the company has been focusing on improving its competitive position through both instrumental and procedural actions. Since 2016 it has taken part in the “Responsible Innovators” project promoted by the Emilia Romagna Regional Government and its Chambers of Commerce. Since 2018 it has been on the prestigious list of the Emilia Romagna Regional Government’s “Responsible Innovators”.